Australia saw Rosberg get off to a flying start with the win, and McLaren having their best race weekend in a long time picking up 2nd & 3rd to lead the constructors championship going in to round 2. The race weekend started out with Mercedes dominating as they did in Australia, and looking very strong in the practice sessions, with one of either Rosberg or Hamilton topping every session. 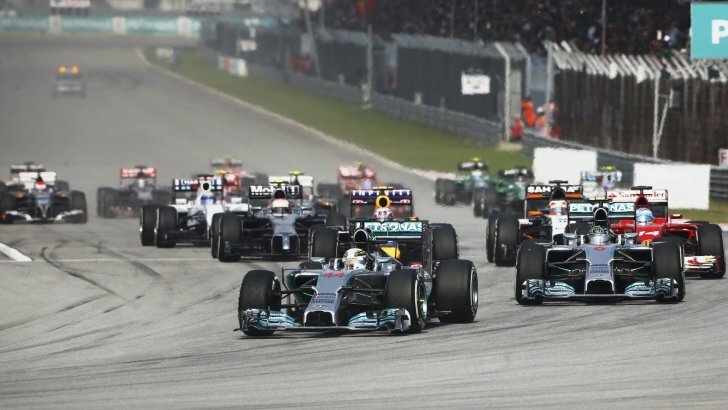 The Malaysian GP is well known for its changing conditions, and this theme continued very much when qualifying was due to start. Heavy down pours caused a large amount of disruption to the start of Q1 and eventually led it to being delayed for nearly an hour. Once the session got under way, the track had dried enough for drivers to feel comfortable going out on the intermediate tyres. There hadn’t been much driving in wet conditions for a lot of the drivers in the new cars. So the first few laps were more of a discovery session and for them to test the limits of the car. 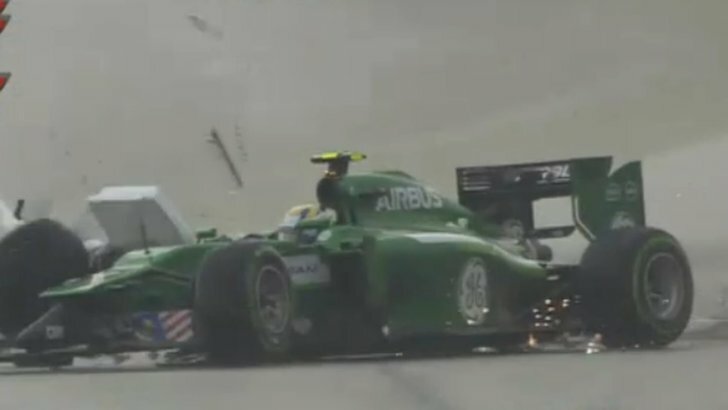 Marcus Ericsson was one driver caught out by the conditions, getting his car on to the kerb a little to much on the exit of turn 3 causing him to spin and crash out. The red flag was out for Q1 but with only a few seconds remaining it didn’t cause too many upsets. Rosberg topped the session with Maldonado, Sutil, Bianchi, Kobayashi, Chilton and Ericsson all dropping out. Q2 was only under way for a couple of minutes before the 2nd red flag of the day was out after Daniel Kvyat and Alonso made contact leaving debris on the track. The session ended with Hamilton on top and Kvyat, Gutierrez, Massa, Perez, Bottas and Grosjean out. The tough start to the season continues for Lotus with Grosjean and Maldonado both failing to get to the top 10. Full wets were needed for Q3 although Button opted for Inters to try something a little different, unfortunately it didn’t pay off for him and he qualified 10th. Vettel managed to split the Mercedes cars early on, but didn’t quite time his final lap run correctly, and missed out on one more flying lap. Hamilton qualified 1st with Vettel and Rosberg behind. On to Sunday for the start of the GP, the sun had come out and the conditions looked good. Hamilton got off to the perfect start and led the race in to the 1st corner. Rosberg has also had a flying start and flew up the inside of Vettel almost touching the wall and beating him in to 2nd position. Ricciardo, keen to make up for his DQ last race, pushed Vettel hard and made it past him to move in to 3rd place. Vettel not wanting to be out done by his ‘rookie’ team mate fought to take the place back on the 4th lap. By this point Hamilton was gone, he had built up a good lead early on, and it was looking likely that he couldn’t be caught. Valtteri Bottas was another driver keen to impress and he was pushing hard to overtake team mate Massa, until, after Massa complained over the radio, he was told to back off. Mid way through the race Vettel was looking pacey, and was catching Rosberg after a round of pitstops. But Rosberg had a bit of luck on his side as Sutil retired from the race on the start finish straight causing yellow flags to be shown and DRS to be disabled. Had it been enabled I think Vettel could have got him. But after sitting in Rosbergs drag for a few laps, it looked like the fresh tyres had lost there initial pace and grip boost. There was talk of rain over some of the radios in parts of the tracks, which could make for an interesting end to the race. Thankfully, I’m sure the drivers thought, it stayed away. But that didn’t mean Ricciardo’s day wouldn’t be ruined. Launching too early from a pit stop, his front left wheel wasn’t secured which meant he had to be pushed back up the pit lane for it to be sorted. He lost a whole lap to Alonso who he was battling for 4th with. But misery didn’t end there, with a 10 second stop and go penalty issued for an unsafe pit release, AND his front wing failed. Eventually Ricciardo had to retire from the race. 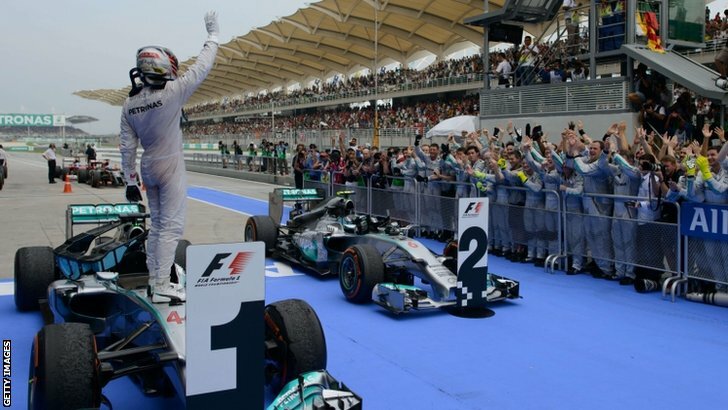 Hamilton brought home the win with an impressive display, Rosberg had 2nd and Vettel picked up his first points and podium of the season with 3rd place. Ultimately it was another frustrating weekend for a few teams. Redbull saw Riccardo without any points for another race. Lotus had only Grosjean finish, but still outside the points. They have suffered a very bad start, and I’m sure they will be hoping there fortunes quickly turn around. After an impressive opening for McLaren, they were knocked a little bit back to reality with Button managing a good 6th and Magnussen getting 9th. Still not bad, but they still have a way to go before they will be realistically fighting for podiums on a consistent basis. For me Hamilton was the stand out performance over the weekend. He showed consistently quick times in both the wet and dry. He controlled the race from start to finish with ease, and never looked like he could be caught. Mercedes are off to an impressive start, and I get the feeling their dominance could continued for a little while longer. Redbull are getting there, but Ferrari aren’t showing enough pace just yet. But as we all know, the teams always improve a lot over the course of the season. After the dominance of Redbull for the past 4 years, this season I’ve found myself going for “Anyone But Redbull” fandom. So far I’m happy to say I like the way the season is shaping out. While currently it does look like Mercedes will walk away with both titles this year, you can’t write off Redbull entirely. 2 races in which terrible luck has struck either one of both drivers, the constructors and singles championship may be a little closer. But that said I’m glad Redbull aren’t off to an instant winning season. The race itself as Will covered looked all too easy for Hamilton. Perfect start to the first corner, Rosberg just squeezing past Vettel probably gave Hamilton that bit more confidence knowing it was another Silver Arrow in his wing mirrors rather than a Redbull. It was just a perfect race day for him. I do wonder how far it’ll be into the season before we get a more complete grid of racers actually finish a race. But as it stands with a few of the bigger and mid table teams struggling, it’s paying out for Caterham who took a 13th and 14th place finish which could ultimately help them finish above Marussia at the end of the season. Never know this early into the season one of the 2 back running teams could end up with a point finish. After the impressive 1st race from McLaren and Williams, they both fell back to lower point places, but that in itself is still promising, especially for Williams who didn’t pick up a point last season. I’m sure Bottas will be grumbling about Massa not following a team order, and would argue that he could of potentially pipped Button for more valuable points, So it’ll be interesting to see how the team relationship goes on from here. Moving back onto Redbull, Ricciardo must be wondering when he’ll catch a break. He’s definitely delivering on the track, but is just incredibly unfortunate that things haven’t worked out for him in his first 2 races this year. And Ferrari aren’t quite there yet. Alonso will always drag the car along and get the best available finish and did that in Malaysia but the car just isn’t quite there to keep up with Mercedes or Redbull, unfortunately Kimi just isn’t finding his feet yet with them. And it was promising to see a Lotus finish a race given the lousy pre-season they had. So a positive for them even if it wasn’t a point finish. While it’s definitely looked easy for Hamilton and that in itself should make him ideal nominee for driver of the day, I’m going to give it to Nico Hulkenberg. He’s yet to find a seat in a big team, but all the mid table teams he’s raced in he’s pushed what’s available to him to the limits, and it looks like it’ll be another case of it this season as he managed to push his Force India higher than most would of expected. I’m sure it won’t be too much longer before some bigger teams do finally come calling.